Solestar Kontrol BLK cycling insoles, with patented stabilization delta, perfectly fit my Sidi Wire Speedplay shoes, stabilize my feet and keep them locked into position. In this article I will look at the innovative design of the Solestar insoles and share my own practical ride experiences. I will compare the Solestar Kontrol BLK insoles with the stock Sidi Wire insoles and the Specialized BG fit insoles. Finally I will share a brief overview of the other Solestar cycling insoles. Solestar BLK insoles are aimed at the competitive- and professional cyclist or triathlete. These insoles are optimized for power-transfer and stability, due to a stiff, lightweight core made of high quality carbon. You can see a part of this large carbon piece in the middle of the back side (however the carbon piece runs from heel to toe). Combined with the Solestar Stabilization Delta this results in optimal support of the foot. The video above shows the function of the Solestar Stabilization Delta. Basically the Solestar Stabilization Delta, supports the arch of your foot and clamps your foot with a light bulb just behind the ball of your foot. The insole is also slightly thinner above the big toe joint bringing it closer to the pedal axle. 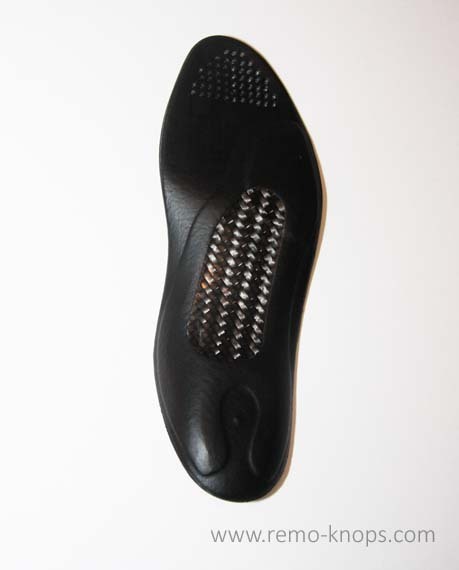 When you take the Solestar BLK insoles from the box you directly notice the high quality finish. It simply feels like a premium product and over the past 6 months the Solestars have proven to be without any wear so far. Despite the fact that I’m not injury sensitive, I needed to get used to the clamping behind the ball of my right foot. Funny enough no issues with my left foot, but not all insoles and feet are identical. Looking back it took me about 6 rides to fully get my right foot adjusted to the new position. The Solestar BLK insoles seamlessly fit into the Sidi Wire Speedplay shoes, you simply can’t install them incorrectly due to the excellent fit. Over the past 6 months I have been super happy with the solid neutral position of the foot in the shoe. Your foot is locked into a neutral position, which results in a solid and good down-stroke of your pedals. I even got feedback during a bike fitting session that my pedaling was solid and stable. Solestar has five different cycling insole products that are aimed at different types of cyclists and different price ranges. From the tour-once-a-week cyclist up to the very best world tour professionals. However all the four Solestar insoles have the same design principles and the Solestar Stabilization Delta. Ergon IP3 Solestar is the latest Solestar product and the result of a collaboration with another German company Ergon. Ergon creates all kinds of ergonomic bike components and tools. Check also my review of the Ergon TP1 Cleat Tool for Speedplay, Shimano SPD-SL, Look Keo and Crank Brothers pedals. The Solestar Tour is also new and has a blue color coding, while the Solestar Kontrol has received some updates. Solestart BLK and Solestart custom insoles are aimed at the competitive and professional cyclist or triathlete. The Solestar Custom insoles are individually fitted to the cyclist, and really aimed at the professional level where marginal gains matter. Solestar supplies the Canyon SRAM racing team, the Canyon Enduro team as well as a lot of known professional cyclists from various teams that are using these insoles. Among these world tour contenders are Fabian Cancellara, Andre Greipel and Matteo Trentin. Shoes, pedals and saddle are the main contact points of a rider with his bike and super important for comfort and control. These are also items that are really rider specific and a matter of personal preference. I’m a longtime fan of Speedplay Zero pedals for example, because I can fine tune the cleat position with the Ergon TP1 Cleat tool. Over the past 2 years I’ve really fell in love with the Sidi Wire SP shoes with their Speedplay specific sole (4 bolt design). A major shoe brand like Sidi knows quality and rider comfort. However I felt there was also room for my feet to move a little. 🙂 I wanted to have a more supported front foot, so I did some research and got some first hand experiences from a fellow cyclist on the use of Solestar insoles. When during the Christmas period last year a very interesting sale was available through the Solestar website, I couldn’t resist and opted for the Solestar BLK insoles. While not cheap you get a very high quality insole that will lock your feet in a solid position. You have 30 day return period, but please keep in mind that you need to get used to the new fit during a couple of rides. Check out the interesting Solestar Control Road clearance sale on the Solestar website. P.S. Check out a list with all cycling related product reviews on this page. Hey!, I found this information for you: "Solestar Kontrol BLK Cycling Insoles". 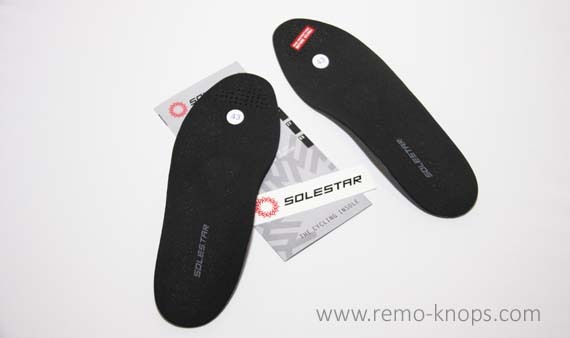 Here is the website link: https://www.remo-knops.com/5692/solestar-kontrol-blk-cycling-insoles/. Thank you.